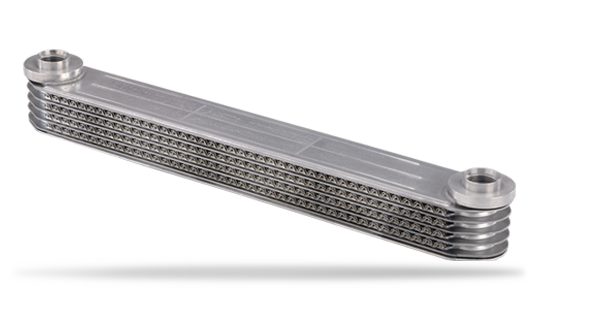 The Long® radiator in-tank engine oil cooler and other Dana engine thermal-management products provide advanced cooling for reduced thermal load to improve engine performance and durability in extreme conditions. This oil cooler is commonly used on gasoline engines requiring engine oil cooling capacity, such as engines requiring additional capacity. This type of cooling maintains oil temperature during heavy-duty use. Designed to be mounted inside one of the radiator tanks, this engine oil cooler has the following oil flow process: Oil lines are routed to the oil cooler. Here, oil flows through the inside of the cooler as cold water in the radiator tanks flows around the exterior. Optimal performance is achieved when the oil cooler is mounted in the cold side radiator tank, which is where hot oil and cold fluid (glycol/water mixture) will have the greatest inlet temperature difference.